I was standing down on Dronning Louise's Bridge this morning, in the midst of the rush hour. I was waiting for a film crew to arrive to shoot a little clip for the Danish Architecture Center. They were late. Stuck in traffic. When they arrived I could see their film gear could have easily fit onto a cargo bike and I mocked them accordingly - with a smile. While I was waiting I beheld the morning rush hour on the busiest bicycle street in the world. I still am amazed to stand there and watch it. I never tire of it. I started counting the number of bicycle users who were waiting at each and every light cycle. There were at least 120-150 in the peak of the rush hour and they were, as a rule, backed up because of the red light. This is where the otherwise brilliant Green Wave (cycle 20 km/h and hit green lights) dies. 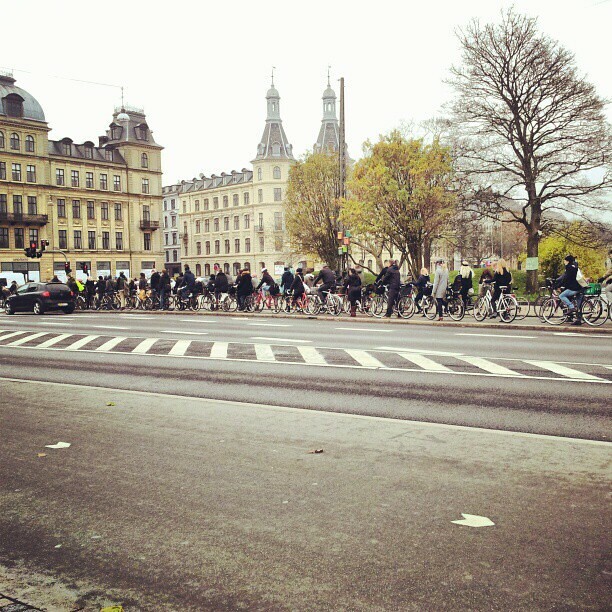 At each traffic light cycle there were, on average 2-8 single occupant cars, as well as many busses. In the photo above there is one car waiting for the light and more than 100 bicycle users - the queue continues out of frame to the right. The timing of the traffic light cycle, however, was clearly based on some geeky car-centric computer model. It is completely and utterly out of touch with the current daily situation and the Desire Lines of the vast majority of the people using this intersection. It prioritizes automobile traffic in both directions and the engineers who run this aren't sorry or shy about it. There were no traffic light cycles that allowed all the bicycle users waiting at the red light to make it through at the peak of the rush hour. Many had to wait for the next cycle. In the summer months I've observed bicycle users waiting for three light cycles before be allowed by the engineer and computer model to continue on to work. The bicycle users should be given a light cycle that is at least double the length in the morning rush hour - and then in the opposite direction in the afternoon. Sure, it would be promoting and encouraging cycling but you know what? It would the rational, logical and modern thing to do, too. But then again, this is The New Copenhagen.